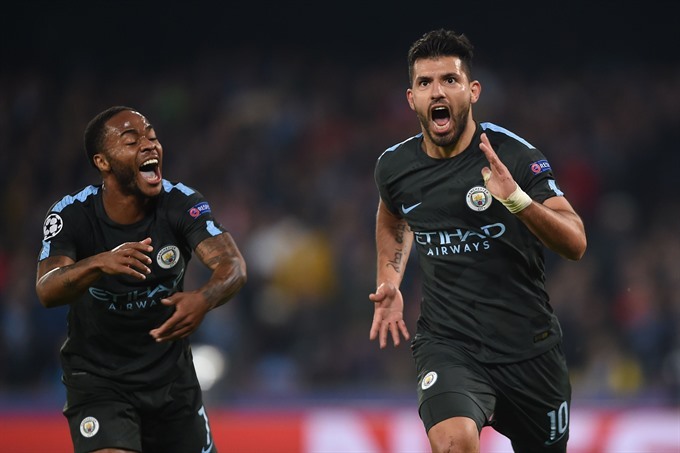 NAPLES — Sergio Aguero became Manchester City’s all-time record scorer and was described as "a legend" by coach Pep Guardiola whose side booked their place in the Champions League last-16 with a 4-2 win at Napoli on Wednesday. "What he has achieved has made him a legend, he’s gone down in history, so I would tell him to enjoy," said Guardiola. But City’s fourth victory out of four in Group F confirmed their progress with 12 points. Napoli are third, six points behind Ukrainian side Shakhtar Donetsk who beat Dutch side Feyenoord 3-1, and are close to elimination from the elite European competition. City fought back despite a dominant early display from the Serie A leaders in their San Paolo Stadium stronghold before defender Faouzi Ghoulam went off with a knee injury. "I’m really happy we’re in the last 16. It was a great victory tonight," said Guardiola. "They completely destroyed us in the first 20 minutes especially Ghoulam and I wish him well. We suffered a lot but our players showed personality. "The point is how in the bad moments the team react and they did really well. The level of football for a spectator was just amazing all I could say was ’wow." City’s John Stones edged the visitors ahead three minutes after the break. But to the delight of the home crowd Jorginho converted a penalty to make it 2-2 after 62 minutes. Napoli started brightly with captain Hamsik and Mertens both having early shots on goal but Ederson cleared. "The result is unfair considering the performance we put in," said Insigne. "There are some regrets, as we put the best team in Europe under pressure for a good long while." Maurizio Sarri’s Napoli suffered a blow when Ghoulam hobbled off with a knee injury midway through the first half with Christian Maggio coming on. The hosts were clearly shaken by the Algerian defender’s departure, Arguero went close for City with a deflected shot but defender Otamendi quickly headed in the equaliser after 34 minutes. "Ghoulam’s departure hurt us," said Sarri. "But we showed we are getting closer to these top teams." Stones powered in his header after 48 minutes for a 2-1 lead but Jorginho levelled from the spot just after the hour from the penalty spot when Sane upended Raul Albiol.